The highest level of customer satisfaction is what we at the Law Office of J. Patrick Henry strive for on a daily basis. We also provide rigorous and affordable criminal defense and other legal services from our Kingston, Tennessee, office. Our own J. Patrick Henry is a former law enforcement officer. As such, Mr. Henry has skills not typically found in other criminal defense attorneys. These include astute investigative and interview skills that can make a big difference to the resolution of our clients' criminal defense needs. A keen understanding of the importance of the unique differences in the details of each criminal case means the law office encourages and engages in full communication between lawyer, staff and clients. A strong attorney-client relationship matters regardless of the charges, be they drug-related, assault or property crimes. In addition to protecting the rights of our clients addressing criminal charges, we also provide legal representation in the areas of driving under the influence; family law matters such as divorce, custody, child support; juvenile law; post-divorce issues; and a full range of personal injury law. We welcome our Tennessee clients from the Kingston area as well as the surrounding counties of Roane, Anderson, Loudon, Rhea, Meigs, McMinn, Monroe and more. 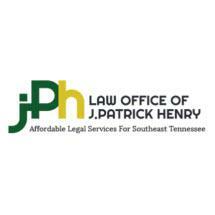 At the Law Office of J. Patrick Henry, we accept credit cards and other forms of payment. We also offer free initial consultations.